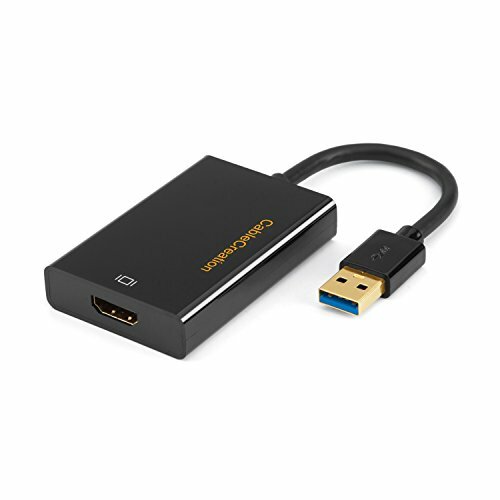 High definition Resolution With point to point transmission technology, this DisplayPort to VGA Video converter allows to stream high definition video 1920x1200(up to Full HD 1080p) in your DP compatible computer to monitor or projector with VGA. 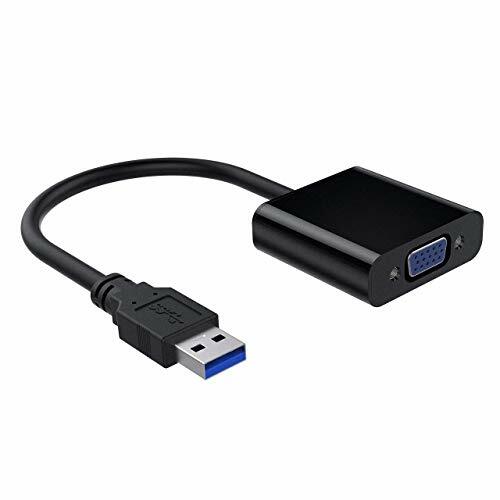 Active Conversion Compatible with AMD Eyefinity Multi-Display Technology, this DP to VGA active adapter supports to hook up extended monitors to your computer for gaming or digital signage application. Easy to use Plug and play. No external power adapter is needed. With this adapter, you can mirror or extend your desktop for an expanded workstation or show presentations at school or work. An Ideal Connection Solution. 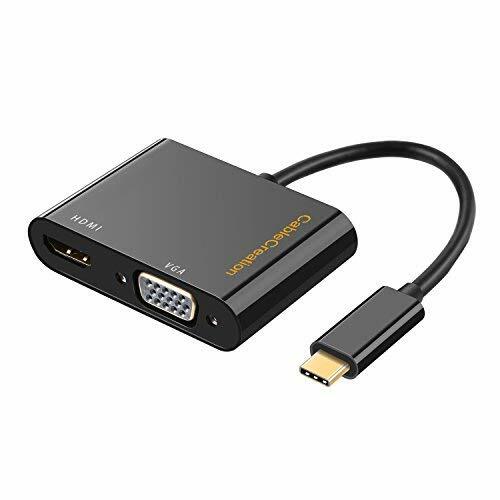 This DP to VGA adapter allows connecting a DisplayPort compatible desktop or laptop to a monitor, projector or HDTV with a VGA port. A VGA cable is required (sold independently). This Display Port to VGA converter is perfect for sharing contents in your computer to a larger screen. Crystal Clear Images. This DisplayPort Male to VGA Female Cable supports highest resolution up to 1920x1080 (1080P) full HD. 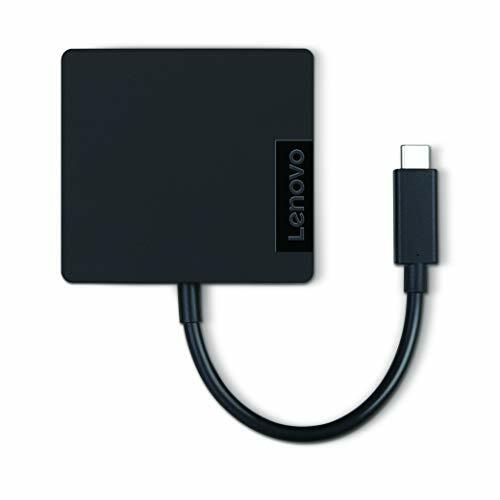 Get a DP to VGA adapter and easily to create home theater or make presentations at meetings. High Performance. This DisplayPort to VGA cable allows for video bandwidth up to 10.8Gbps, giving you fast transmission speed. Configure your monitor for an extended or mirrored screen. High Quality. Gold-plated connector resists corrosion, provide rigidity and improve the signal performance for durability. This male display port to VGA cable has embedded clock architecture to help reduce EMI susceptibility. Reliable Connection and Warranty. DisplayPort with latches offer secure connection. Please depress the release button before unplugging. Every product from VicTsing will enjoy 45 days money-back and 12-month worry-free warranty. DESCRIPTION This USB 3.0 to VGA Adapter is used to connected a USB-enabled devices( such as laptop, desktop) with a VGA-enabled devices( such as monitor,projector, TV) for multi-monitor solution,extending working space with split-screen, mirroring display, etc HIGH RESOLUTION If connected to USB3.0 devices, resolution is adjustable and the maximum resolution can be up to 1920x1080@60Hz(1080p), if connected to USB2.0 devices, resolution is 800x600@60Hz. HIGHLIGHTS Leverages the adoption of USB 3.0 providing fast and smooth signal transmission. Backward compatible with USB2.0 computers. COMPATIBLE LIST PC Laptop Windows 7/8/8.1/10,Desktop, Laptop, PC,Monitor, Projector, HDTV, Chromebook, Raspberry Pi, Roku, Xbox and More BUILT-IN DRIVER The driver files (FL2000-2.1.34054.0) are stored in adapters. No additional CD-ROM drive required. We also provide the driver download address: https://support.frescologic.com/portal/kb/articles/latest-drivers INSTRUCTIONS 1. Insert the device into the computer USB3.0 interface. Connect second monitors and devices to the VGA connection line. 2. Look up and run FL00.EXE in the device disk. Restart the computer after the installation is completed. 3. After reboot, the second monitors correctly display the image. Set the resolution to 1920*1080. End. High Resolution Functions like an external graphics card offering flawless high definition video transmission to your monitor or projector. Supports up to 1920 x 1080 for compatibility with most displays, monitors and projectors with VGA. To ensure high resolution output, make sure that the USB port supports USB 3.0 to enable high resolution support. USB3.0 Interface, Fast Transmission. Leverages the adoption of USB 3.0 providing fast and smooth signal transmission. Backward compatible with USB2.0 computers. Wide Compatibility. Support Windows 10, Windows 8.1, Windows 8, Windows 7, Windows XP, etc,No need to install CD. Easy Hassle-Free Installation Built-in drive, no CD-ROM, just a few simple steps. You may also contact our customer service team should you need further assistance. If connected to USB3.0 devices, resolution is adjustable and the maximum resolution can be up to 1920x1080@60Hz(1080p), if connected to USB2.0 devices, resolution is 800x600@60Hz. Leverages the adoption of USB 3.0 providing fast and smooth signal transmission. Backward compatible with USB2.0 computers. No need to install CD. Amazon 30 days money back protection and 18-month product warranty. VERY IMPORTANT: Please bear in mind that you can Only connect to 1 external monitor at a time. 1.In order to enjoy the 4K high resolution, please make sure to use a 1.4 or higher version HDMI cable, and 3+9 VGA cable. Please bear in mind that If two outputs are connected, then only one output can receive the input signal, The priority sequence is: HDMI, VGA. It allows you to transmit signals from a Type-C source to a high definition HDMI or VGA display (TV, projectors, monitor,etc). 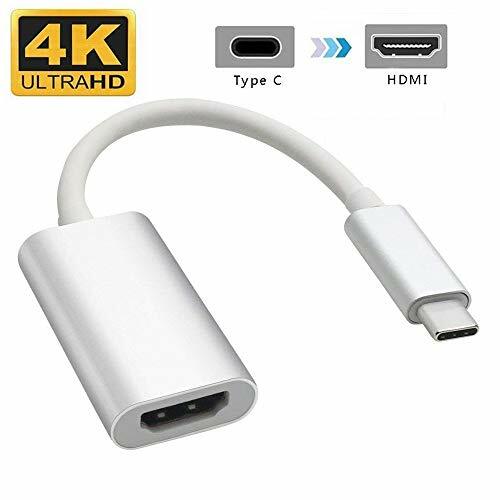 Wide Compatible:CableCreation USB C to HDMI VGA Compatible with 2018 iPad Pro/Macbook Air/Mac Mini,2015/16/17/18 MacBook 12/13/15,2016/17/18MacBook Pro, Dell XPS12(9250)/Dell XPS13/Dell XPS15/Dell Precision5510,HP Spectre X2/HP Spectre X360/HP Elitebook Folio G1/HP Elite X2 1012 G1/Acer Switch Alpha 1,Acer Spin7,Acer Chromebook R13,Google Chromebook Pixel,Lenovo 900/910/920,Samsung s8/Samsung S9/S9plus,HuaWei MateBook,Hua Wei Mate 10. NOTE:It does NOT CHARGE your laptop while connecting to a projector through the usb-c port.This adapter ONLY support display from type c port to HDMI port and the USB C port only as the input. What You Get: CableCreation USB-C to HDMI VGA Adapter, user manual, worry-free 1 year warranty and friendly customer service. If you have any concerns at all, please don't hesitate to email us. Use the Lightning to VGA Adapter to mirror whatever s on your iPad with Retina display, iPad mini, iPhone 5, and iPod touch (5th generation) with Lightning connector apps, presentations, websites, and more on your VGA-equipped TV, display, projector, or other compatible display in up to 720p HD. Video mirroring is supported on all compatible devices. Watch video on the big screen in up to 1080p by connecting your device with a Lightning connector to a television, projector, or other VGA-compatible display. Video out supports up to 1080p for iPad mini, iPad with Retina display, iPhone 5, and iPod touch (5th generation). The Lightning to VGA Adapter connects to your iPad with Retina display, iPad mini, iPhone 5, or iPod touch (5th generation) via the Lightning connector to your projector or display using the VGA adapter. Put your slides, movies, photos, and everything else on your iPad with Retina display, iPad mini, iPhone 5, or iPod touch (5th generation) with Lightning connector on an even bigger screen: a VGA-equipped TV, monitor, or external projector for video mirroring. 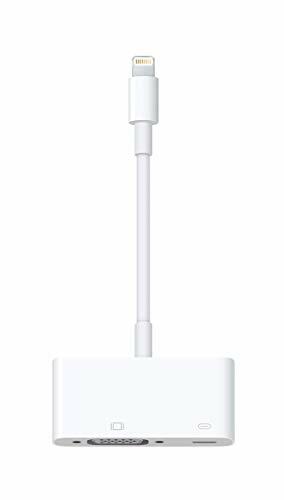 The Lightning to VGA Adapter mirrors exactly what you see on your screen so that everyone in the room can enjoy it. The Lightning to VGA Adapter supports video mirroring on all compatible devices. If you have any questions with our products, please tell us. It's a simple T-shirt dress, but cute. Occasion: Our t-shirt dresses are suitable for almost all kinds of occasion. You can wear it to anywhere you like. Like casual, beach, work, go for a walk. Materials: Cotton and Polyester. Soft and comfortable fabric,very light weight but not see through. Breathable and stretchy,make you feel cool in hot summer. Special gift for mom, daughter, girlfriends or wife. 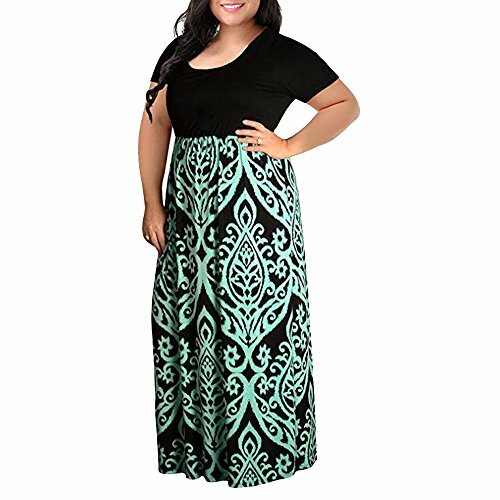 It's also a perfect dress for pregnant women. Do you want to share the wonderful video and pictures with your families or friends? Our 7 in 1 USB-C HDMI VGA RJ45 Adapter meet your all needs. Mirror/extend what display on your screen via USB C to HDMI port hub directly stream 4K UHD or Full HD 1080p video to HDTV, monitor or projector. It can up to 1000Mbps, Let you enjoy higher speed & more stable network. PD port keeps your devices always full of energy.Note: The RJ45 Gigabit Ethernet Port can't use with phones/tablets/nintendo switch. 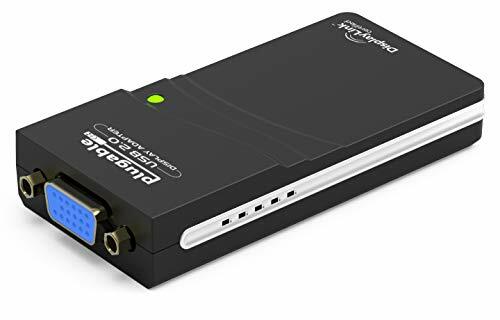 Using VGA and Audio ports, getting one more choice to enjoy high quality audio-visual experience in case there is no hdmi input in your monitor . 5Gbps data transfer, 0.9A current of each ports, let you connect with more external USB devices. Samsung DeX Function: Turn your phone into a PC-like experience. Connecting your Samsung Galaxy ,Huawei Mate 10,Mate 10 Pro to a monitor, keyboard and mouse for a desktop experience. So you can turn any place into a workplace with your phone. Note: To enter DeX mode pls introduce external power to this adapter via the usb type c power delivery. When use with Nintendo Switch,please introduce external power with the original Switch power adapter & cable, or use other power adapter (30 watt at least); otherwise,it won't get enough power to work. 4K HDMI High Resolution & Larger Viewer Mirror or extend your screen with the HDMI port and directly stream video to HDTV, monitor or projector; Reach to max resolution of HDMI 4K@( 3840x2160P)30Hz UHD or 1080P@60hz Full HD.The output of HDMI and VGA can be supported at the same time, both resolution are 1080P,giving you a larger view and clear visual feast. Samsung Dex Mode Support Samsung Dex Station function by connecting your smartphone and monitor via HDMI port in the hub.Converting your phone into a PC like platform.Have desktop experiences with Galaxy S9/S9+/S8/S8+,Note 9/8,Huawei Mate 10/Mate 10 Pro (Important Note: the Dex mode ONLY compatible with those model of cellphones mention above). Nintendo Switch HDMI Adapter With the unique designed USB 3.0 to HDMI Adapter,you can connect your Nintendo Switch to any HDMI TV devices, great replacement for your big and heavy original Nintendo Switch Dock, and you don't need to worry about heat dissipation anymore.BUT please use the original Nintendo Switch power adapter, or other adapters which 30 watt at least; otherwise, it won't get enough power to make it work. 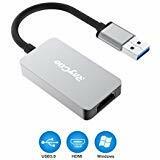 Multi-function & Wide Compatibility This USB C to HDMI Adapter not only support Samsung Dex PC station mode desktop experience for Galaxy S9/S9+/S8/S8+,Note 9/8,but also compatible 2018/17/16 MacBook/MacBook Pro,Google Chromebook Pixel,Surface Book 2 and an ideal Nintendo Switch Dock alternative as well. Guarantee: If you have any problems with our adapter, please email us. We provide 12-months warranty and professional customer service & technical support. 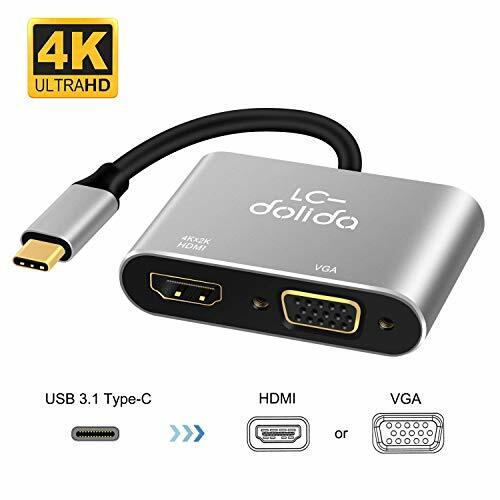 7 in 1 Multi-port USB-C Adapter LC-dolida type c to HDMI VGA hub with 2*USB3.0 ports/ Power Delivery Charging port/RJ45 Ethernet port/3.5mm audio jack.RJ45 port supports max 1000Mbps network transmission, making you enjoy high speed network; HDMI(4K@30Hz) & VGA let you connect one/two external monitors enjoy HD video/game on big screen.USB-C power delivery port max support 87 watt charging to keep your device always full of energy. USB3.0 ports allows you connect more external usb devices. Feature : Interface: 1 x USB 3.0 port, 1 x HDMI port Computer connection: 5Gbps of bandwidth on USB 3.0 Port System Requirement: Windows 7/8/10/XP operation system Max Resolution: USB3.0 maximum resolution of 1920x1080 Video Function: Primary, Extended, Mirror Warm tips: This video graphics adapter is not compatible with MAC, VISTA, LINUX. The USB to HDMI HD display converter backwards compatible with USB 2.0, however the resolution is 800x600. Better to turn off anti-virus software and low down the firewall level before install the driver. You can turn on them after the installation. If the driver don't pop out when it plug in your computer, please manually download the latest driver from our website [ Pls remove the adapter while you restart computer. ] Please search " Download - Hoplaza " from GOOGLE, and download the driver. Any question of this product please be free to contact us instead of negative review. Function: > Do the presentation on a big screen. > Split screen makes work more efficient. > Watch the high definition movies on a large screen. > View new alert while viewing real-time stock quote. > Image and video synchronization to provide visual enjoyment. > Showing documents on one screen while do a video conference. USB to HDMI Audio/Video Adapter The USB to HDMI adapter connects a computer via USB to an HDTV, monitor, or projector with HDMI. Convenient external graphic card solution to mirror or extend desktop / laptop PC screen across additional HDMI monitors. 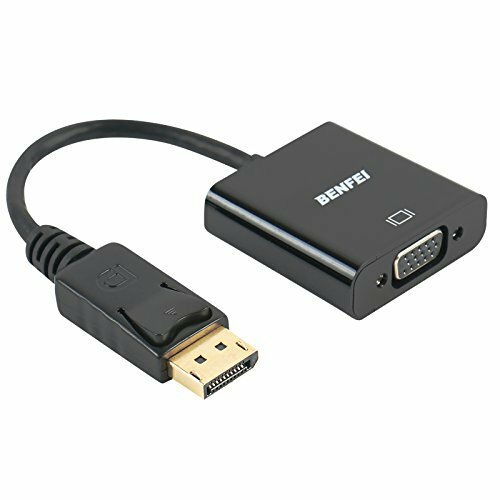 High-Definition Graphic Images Leveraging the high-bandwidth (5Gbps) Super Speed USB 3.0 interface, this USB 3.0 to HDMI offer a high-definition graphic images to your HDTV or monitors. Supports resolutions up to 1920 x 1080 @ 60 Hz for enhanced visuals (Only USB 3.0 connector can achieve HD 1080P, for USB 2.0 port, it only can be 800 x 600). Support Multiple Monitors This Video Cable Adapter could connect multiple monitors with additional adapter(up to 6 additional USB Display, One display adapter required per monitor) at the same time. Noted: Connecting with multiple monitors needs a high requirement for your computer performance & configuration. Extend and Mirror Display The USB to HDMI convertor not only could sync image with display to give you a visual enjoyment, but also support to extend the computer with split screen display to enhance your work efficiency. Ideal for games entertainment, home theater, video conference, corporate training, etc. Simple Operation Please install it's internal driver directly or manually download the driver from our official website. Plug it into your computer, then open the USB device folder and double click to install the driver. Multiport connection: USB C hub includes 1 USB Type-C Female PD charging port, 1 HDMI port, 1 VGA Port, 1 USB 3.0 Type A port, 1 3.5 mm Audio ports. Plug and play, no additional driver/software required. Premium aluminium casing for better heat insulation. 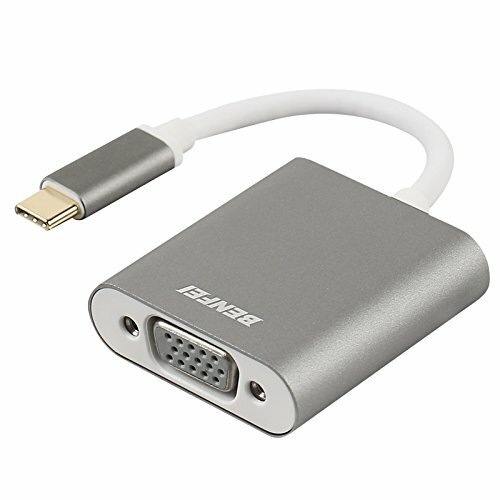 USB C to HDMI VGA Adapter with HDMI and VGA port can work at the same time. Audio and Video signals from a PC equipped with a USB Type-C terminal can be output simultaneously to a display, TV, projector etc. equipped with HDMI or VGA input terminal. Power delivery: support PD charging at max 100W, This multiport USB C adapter provides one Type-C pass through Female port by which you could securely charge connected MacBook or other Type-C laptops. 18 MONTH WARRANTY & FRIENDLY SERVICE: We promise to provide in-time customer service at any time you need. If you have any question about our USB-C Hub product, please contact us and we will reply to you ASAP. 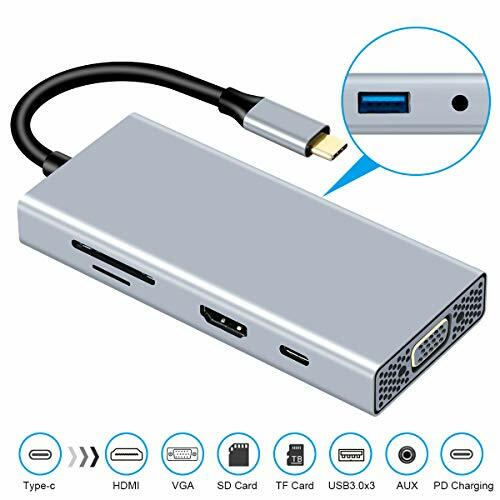 4 in 1 USB-C HUB - This USB C to DVI/VGA/HDMI adapter allows USB C enabled devices( such as MacBook Pro, Chromebook Pixel) to connect with HDMI/VGA/DVI-equipped devices( such as monitor, projector, TV) for multiple monitors, extending working space with mirroring or extending display. NOTE: VGA port can work simultaneously with HDMI or DVI port with maximum resolution of 1920 x 1080P, and two external monitors will show the same image. HDMI & DVI ports can't work simultaneously. CRYSTAL CLEAR IMAGES - The HDMI & DVI ports deliver high-definition video in up to 4K UHD(3840x2160)@30Hz, which is 4 times clearer than 1080P. With Monodeal USB 3.1 Type C to DVI/HDMI/VGA adapter, you can enjoy vivid images, easy to create home theater and make presentations at meetings. VGA PORT - The VGA port allows to stream high definition video 1920x1200(up to Full HD 1080p) in your type c compatible computer to monitor or projector with VGA. The male to female converter will provide fast and smooth signal transmission. NOTE: VGA port allows only video, no audio output. USB 2.0 Port - The USB port is used for connecting and charging compatible devices and peripherals; Compatible with USB flash disk, camera, removable hard drive, mouse, keyboard or other USB A 2.0/USB A 3.0 devices.Transfer data up to 480 Mbps; maximum current output of 500mA. Please Note: 1. You can download the User's Guide on this page if you have any problem during using the adapter, or contact us at any time; 2. You need to install a driver to enable this adapter, drivers can be installed via enclosed CD or at cablecreation.com if you do not have a CD-ROM; 3. CableCreation offers two-year warranty and lifetime technical support, any problem please contact us at first time. Connectivity: Gold plated USB 3.0 Male is Output, HDMI Female is Input. 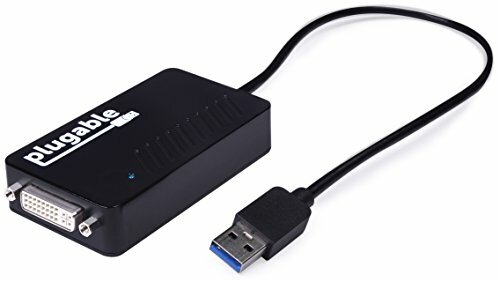 USB 3.0 Converter allows you to connect your desktop PC or laptop's USB port to an extra monitor or TV. You can watch videos or slideshows on the big screen. Compliant with HDMI and DVI specification. 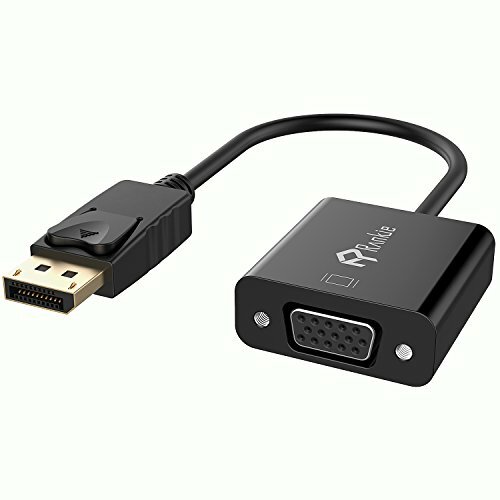 it can be connected to a HDMI Male to DVI adapter, then to a DVI Display Device. High Resolution & High Refresh Rate: sending both audio and video, it's 10x of USB 2.0 and greatly improves the stability of transmission. HDMI output supports 1920x1080p resolution,1.65Gbps/165MHz/24bits bandwidth, supports the function of Primary, Extended, Mirror, Rotate. Featuring the DisplayLink DL-165 graphics chipset, the Plugable USB-VGA-165 enables multiple monitors with virtually any Windows laptop, desktop, or tablet (one adapter required per monitor, up to six on Windows PCs). Supports any monitor or projector with standard VGA/D-Sub connector (does not support DVI, HDMI, or DisplayPort-only monitors). Get the full benefits of USB, including plug and play connectivity, thin and flexible cabling, and ability to connect via USB 2.0 hubs and repeaters. USB graphics adapters work by rendering 2D/3D with your computer's CPU and GPU, and then compressing and transmitting the pixels that change over USB. 2GHz dual core or better CPU and at least 2GB of RAM recommended. Best suited for web and productivity software, not 3D gaming or HD video playback. Supports monitors and PC-compatible TVs up to 1920x1080. Requires Intel / AMD / nVidia main GPU and driver with Windows Aero enabled. USB graphics requires 2GHz dual core or better CPU and 2GB RAM for best performance. Does not support HDCP, and will not allow for playback of encrypted Bluray disks or copy-protected content. Not recommended for gaming or HD video playback. If converting DVI output to HDMI, signal will carry video only, not audio. You need to install a driver to enable this adapter. Drivers can be automatically installed via Windows Update or downloaded directly from CableCreation . USB Type-C Terminal equipped USB Type-C image conversion adapter that converts video signals of PC, tablet, etc. and can output to display TV projector etc. equipped with HDMI input terminal. Dual Output,Work Simultaneously LC-dolida USB C to HDMI VGA Adapter with HDMI and VGA port can work at the same time. Audio and Video signals from a PC equipped with a USB Type-C terminal can be output simultaneously to a display, TV, projector etc. equipped with HDMI or VGA input terminal. Support 4K Max USB C to HDMI Adapter Supports video resolution up to (4K * 2K) at 3840 * 2160P / 30Hz,which is 4 times clearer than 1080P and supports simultaneously video output. when use HDMI alone, It support a large screen liquid crystal TV or display compatible with 4K max output. No Driver,Easy to Use Plug and Play. The USB C to HDMI VGA Converter is unnecessary to install the driver, it can be used easily just by inserting the cable. Also, external power supply is unnecessary and multiple protections are applied for over-voltage, over-charging, over-heat. Aluminum Plate for strong antioxidant capacity. So you can safely and easily use it in your favorite place. 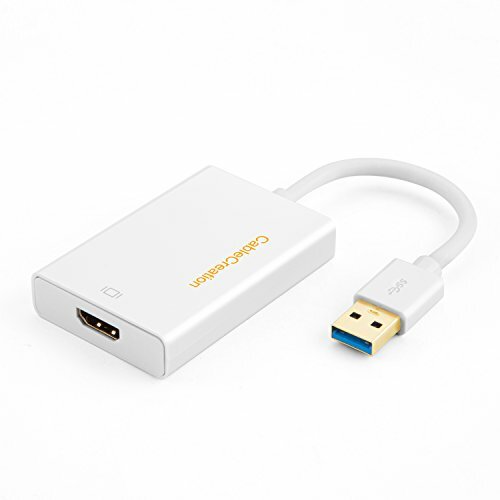 GIKERSY 4-IN-1 USBC to VGA HDMI Adapter makes you more easily to transfer or mirror your USB-C laptop to an HDMI / VGA-ready TV, display, projector or monitor . HDMI video output: Supports video resolution of up to 4K at 30Hz,1080P@60Hz. VGA video output: Supports video resolution up to 1080P@60Hz. USB 3.0 port: supports data transfer rates of up to 5 Gbps. Mirror or extend mode, both two monitors are identical but different with laptop\'s screen. We offer 30-day money back guarantee and 365-day replacement warranty for each product. If you have questions or quality problems while using, please contact us at any time. Multifunction USB C Hub Expand your usb c port to a HDMI, a VGA output, a USB 3.0 and a USB-C charging port.Allows you to expand the desktop to 2 external displays via HDMI and VGA cable; Perfectly work in gaming, working and entertaining. Vivid 3D Effect Video Sync Mirror or extend your screen with the USB C adapter's HDMI and VGA Port ,stream 4K UHD or Full HD 1080p video to HDTV, monitors, or projectors for a cinema-like visual feast. USB 3.0 and Power Delivery The USB 3.0 port provide high speed data transfer speed up to 5 Gbps, easy to transfer a HD movies in short time.Also support 87W PD charging and pass-through charge for the USB-C laptop or smartphone and other devices connected to the hub devices. by HDMI cable. Plug & Play and without external software drivers required or power required. You can enjoy the high-quality video and audio on a large screen. 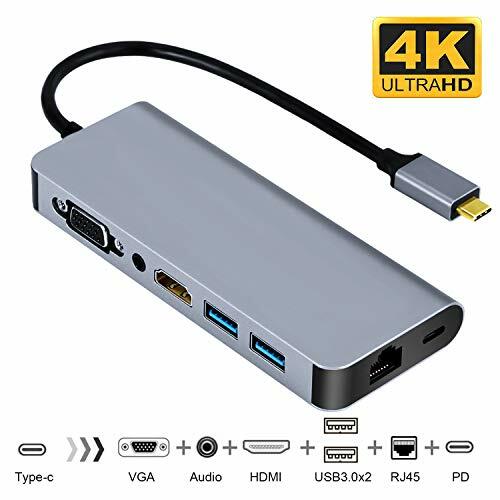 SUPPORTS 4K RESOLUTION This usb to hdmi adapter enable resolutions up to 3840x2160@30Hz (4K 60Hz) and backwards compatible to 720,1080p.Compatible with HDMI-enabled TVs/Monitors/Projectors compatible both video and audio transfer.Stream sports events, watch movies, gaming, and show photos/albums directly from your phone (Samsung Galaxy S8/S9/S8 Plus/S9 Plus/Note 8) and never miss the game-winning touchdown or your favorite TV episodes. No more worry on bad wifi casting issues. Exquisite Design Premium aluminium casing for better heat insulation,Flexible cable for extra durability. Fits snugly with the USB-C ports on your devices, better signal transfer protection suitable compatible the reasonable length of use compatible home, office and travel.our smallest USB-C to HDMI Adapter yet; it s portable and you can take everywhere. USB-C Input Enables reversible plugging and provides total compatibility with the newest computers and devices. Requires USB-C port supporting DisplayPort Alternate Mode or Thunderbolt 3. One cord, four options - Easily connect to an external display, wired network, and a USB 3.0 device via a single USB-C port. Stunning 4K or 1080p - Experience a vibrant 4K display via HDMI or a Full HD experience through 1080p resolution via VGA. Enterprise Ready - The hub provides easy and secure network manageability with selected ThinkPad notebooks. Parts and labor - 1 year limited warranty. See official warranty statement for full details. Do you want to view large or multiple spreadsheets across several displays? Do you want to share your videos or slideshows with your family members, friends, workmate on a bigger screen? This USB3.0 to VGA adapter provides you a great solution. It can be used to mirror your primary desktop, showing the same image on each display, or to extend your desktop to double your workspace and increase your productivity. 7.When you plug it into the USB port, the comsuter will detect that a new device has been plugged.Please turn to "my computer" and find the "FL2000DX (G: )", then double click it to install the software. Reboot your computer once installation is completed. 8.In order to achieve 1080 high-resolution requirements, please exit the antivirus software and use USB 3.0. The portable Jackiey USB to VGA adapter connects a desktop or laptop with USB 3.0 / 2.0 port to your VGA-equipped monitor, display, projector, or HDTV; Tuck this lightweight gadget into your bag to do a business presentation, extend your workspace to increase productivity; Audio must be transmitted separately; A VGA cable is required. The high quality metal USB port to VGA female converter supports resolutions up to 1920x1080@60Hz (1080p, Full HD) including 720p, for high definition external monitors, projectors, or TV; SuperSpeed USB 3.0 supports data transfer rate up to 5 Gbps. 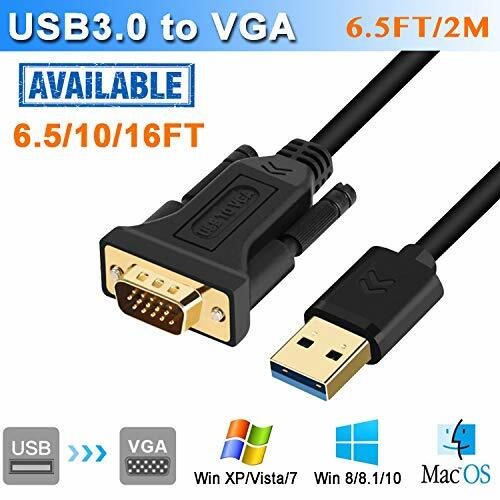 The USB-VGA cord supports Windows 10/8.1/8/7/Vista/XP; and other USB-enabled computer. Exclusive Jackiey Unconditional 12-month Warranty ensures long-time satisfaction of your purchase; Friendly and easy-to-reach customer service to solve your problems timely. 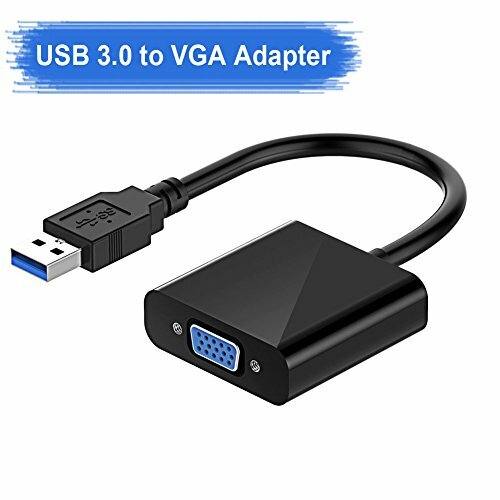 Convert your desktop or laptop computer into a multi-monitor environment with this USB 3.0 to VGA Display Adapter Cable. Allows you connect a VGA enabled monitors, projectors, or HDTV to a host computer to extend or mirror the desktop display, a cost-saving multi-monitor or dual display option. Connect USB to VGA ports directly. No any additional USB-VGA adapter or VGA cables required. Supports resolution up to 1920x1080@60Hz (1080P) over USB 3.0. Extend or mirror your workstation to another screen. Support Operation System: Mac OS High Sierra (10.14.2-latest), High Sierra (10.13.4-10.14.1) Clone Mode Only, High Sierra (10.13-10.13.3), Sierra (10.12), El Capitan (10.11), Windows 10/8.1/8/7/Vista/XP. Not support other device with usb 3.0 port like PS3/PS4, Xbox,chromebook, roku, ect. ONLY FROM USB-TO-VGA Displays (TV/monitors). USB-VGA adapter cable is one-way design. Can NOT be used as a VGA-USB converter cable. -Work with VGA port ONLY, NOT support HDMI / Displayport / Mini Displayport/ DVI ports. USB to VGA adapter cable Connects a USB-enabled devices( such as laptop, desktop) to a VGA-enabled devices( such as monitor, projector, TV). A cost-saving double-monitor or dual-display option. No any additional USB-VGA adapter or VGA cables required. Wide Compatibility Compatible with Mac OS High Sierra (10.14.2-latest), High Sierra (10.13.4-10.14.1) Clone Mode Only, High Sierra (10.13-10.13.3), Sierra (10.12), El Capitan (10.11), Windows 10/8.1/8/7/Vista/XP. Not support other device with usb 3.0 port like PS3/PS4, Xbox, chromebook, roku ect. Premium Quality & High Performance Built in with premium quality chip for stable performance and long life. Supports resolution up to 1920x1080@60Hz (1080P) over USB 3.0. Extend or mirror your workstation to another screen. NOTE 1. ONLY FROM USB-TO-VGA Displays (TV/monitors). USB to VGA adapter cable is one-way design. Can NOT be used as a VGA-to-USB converter cable.2. Please directly contact the USB end to your computer or laptop, not to the docking station or hub. This is a Type-C to HDMI and VGA Adapter. It allows you to transmit signals from a Type-C source to a high definition HDMI or VGA display (TV, projectors, monitor,etc). With this adapter, you can enjoy a better visual feast with your family. 2 in 1 Hub USB-C to HDMI VGA streaming a TypeC-equipped PC or Mac laptop with a duplicated screen to one HDMI-enabled + one VGA-enabled TV / Display at up to 1080p@60Hz simultaneously (Same Output). Or to one HDMI-enabled TV / Display at up to UHD (3840x2160)@30Hz,The converter can transmit high-definition video from your computer to a monitor for presentation, movie watching or gaming, It allows you to experience the best visual enjoyment even at home. 4K Resolution Visual Enjoyment Plug and play, dual screen display, no driver or software required.ideal for office, conference, home-theater entertainment for connecting ChromeBook Pixel/ MacBook to HDTV/monitors/projector with HDMI VGA interface.You can enjoy high-definition video on your large-screen display. 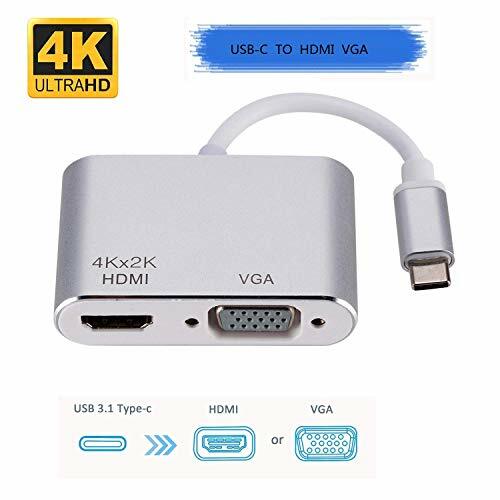 HDMI&VGA Port USB-C to HDMI Adapter offers a screen in up to 4K UHD(3840x2160)@30Hz, which is 4 times clearer than 1080P and supports simultaneously video output. VGA resolution is up to 1920x1200@60Hz. Note: HDMI and VGA ports can work simultaneously with maximum resolution of 1920 x 1080P, and two external monitors will show the same image. VGA out allows only video. There will be no audio output. Reliable Performance Design Aluminum alloy casing for better heat dissipation. Slim, brushed design complements Apple's distinguished style. Using one-piece molding technology, exquisite and compact, easy to carry, you needn't to worry about device compatibility issues on the go. Google ChromeBook Pixel (2017/16),Dell, Asus, HP, HuaWei and many other Type C laptops. 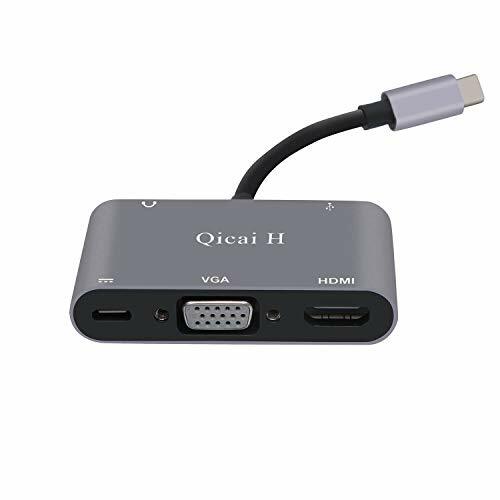 HDMI & VGA Video Output: The output of HDMI and VGA can be used simultaneously, but both resolution are 1080P. If only using HDMI output, the resolution can Up to 4K@30hz and 1080P for single-used VGA output. 1.Mirror your screen directly to a large screen display,you can use it for presentation to work in a large screen workspace. 2.Expand your laptop screen to Projector or Display! First show the video or pictures to the TV or Projector, then hide the screen to the right in your laptop, finally, your laptop can free to work like go online,read a file,etc. Connecting your Samsung Galaxy ,Huawei Mate 10,Mate 10 Pro to a monitor, keyboard and mouse for a desktop experience. Note: To enter DeX mode,pls introduce external power to this adapter via the usb type c power delivery port . Up to 5Gbps data transfer, 0.9A current of each port, let you connect more USB devices.Note: If all ports are used together,please introduce extra power supply via PD port. PD port --Max support 87W charging,keep your devices always full of energy. TF/SD card slot--500M reading speed, sync files from camera/mobile to laptop with this usb-c hub. 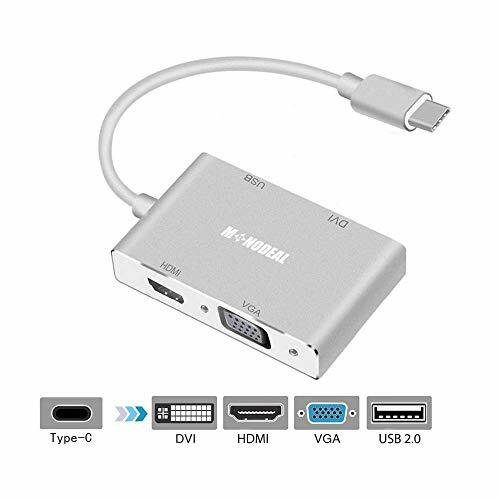 9in1 USB C Multi-port Adapter Our Type C to HDMI VGA Adapter comes with 3*USB3.0 ports+ Power Delivery Charging port+SD/TF Card slots+ Audio.HDMI 4K@30Hz & VGA let you connect one/two external monitors to enjoy HD video/game on big screen. USBC power delivery port max support 87 watt charging to keep your device always full of energy. USB3.0 ports allows you connect more external USB devices. TF/SD Card allows you sync files from camera/mobile to laptop. Dual Output,Work Simultaneously LC-dolida USB C to HDMI VGA Adapter allows HDMI and VGA to output at the same time. Audio and Video signals from a PC equipped with a USB Type-C terminal can be output simultaneously to a display, TV, projector etc. equipped with HDMI or VGA input terminal. But if HDMI and VGA are used simultaneously, both resolution are 1080P. 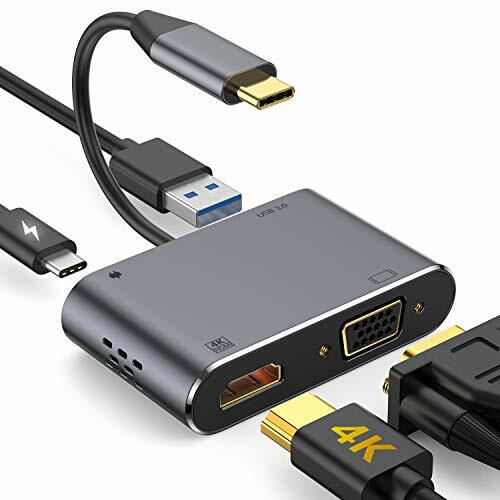 USBC 4K HDMI Display Adapter Enables you mirror or extend your screen with the HDMI port and directly stream video to HDMI-equipped HDTV, monitor or projector; Reach to max resolution of HDMI 4K@( 3840x2160P)30Hz UHD or 1080P@60hz Full HD. Samsung Dex Desktop Experience Our USB-C HDMI VGA Adapter enables you connect your Samsung Galaxy S10/S10+/S10e/S9/S9+/S8/S8+/S8 Active/Note 9/8, Huawei Mate 10/Mate 10 Pro to a monitor, keyboard and mouse for a desktop experience. So you can turn any place into a workplace with your phone. ( NOTE: To enter Samsung Dex mode, please introduce external power to this adapter via the USB type c power delivery port). Compatibility & Warranty Compatible with 2018/17/16 MacBook/Pro/Air,Google Chromebook Pixel,Surface Book 2...It's perfect replacement of the Samsung DeX Station/Pad for desktop experiences with Galaxy S10/S10+/S10e/S9/S9+/S8/S8+,Note 9/8 . Guarantee: If you have any problems with our type c adapter, please contact us. 12-months warranty and professional customer service & technical are supported.